Holidays often are a time for love – love found, lost or sought. In Next Act’s “The 12 Dates of Christmas,” our protagonist, Mary, travels all those paths in a year, but mostly the last one. The 100-minute show without an intermission is a simple reminder – especially important during the season of giving – that our problems so often pale compared to those of others. Like the ghosts visited by Scrooge in “A Christmas Carol,” Mary is “visited” by a whole host of men she dates throughout the year, each helping her understand herself a little better, and just what her place is in the world. Susie Duecker as Mary, a sometimes actress, sometimes barista, takes us on a wild roller coaster ride of relationships, starting with Thanksgiving Day. Mary is watching the Macy’s parade without her fiancé – who claims he ate some bad chicken and won’t be able to be with her on the holiday -- when she spots him in the crowd, kissing another woman right on TV. OK, perhaps it is a bit farfetched, but you fall for it because Duecker sells it so well, as she does Mary throughout the show. Mary travels through each of the holidays with a new relationship, each with some promise, like the guy her aunt sets her up with that “supports charities and runs marathons,” the pediatrician she meets in the subway (where Mary is convinced that the ringing telephone on the wall is some sort of sign), the bartender she meets on St. Patrick’s Day, the two dates she gets at her sister’s wedding (in a bit in which Duecker’s Mary humorously ticks off all the duties of the maid of honor). The show weaves through the seasons to the Halloween stalker and comes full circle to Thanksgiving and dates with a rock musician, another disappointment. The final season finds Mary in a foul mood after she meets her ex and gets the role of The Ghost of Christmas Past in “A Christmas Carol,” where she meets an adorable Tiny Tim who inspires her with the adult way he deals with adversity. In the show’s span of one year, Duecker takes Mary through a lifetime of emotions – the highs of a relationship that seems to be going well, the lows of a bad date. She wears her emotions on her sleeve, or on her pants leg as when she kick-boxes to let off steam. She also takes on a whole host of characters – her pushy mother and bespectacled Aunt Kathy (with the patronizing Southern accent), her sister, her boyfriends – even Tiny Tim. 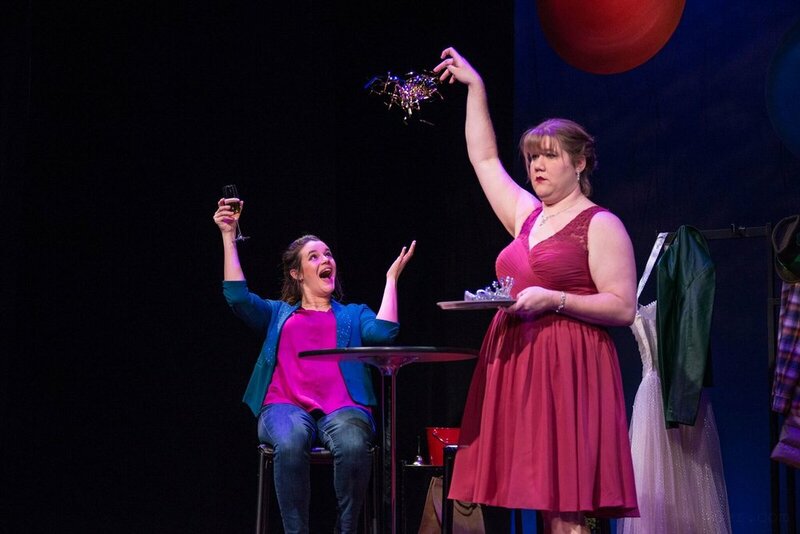 Mary (Susie Duecker) feigns her excitement as the New Year arrives with an unenthusiastic flourish from one of the Doo Wop Duo (Kelly Doherty). There is a bit of cliché every now and then – like the old, worn “whatever doesn’t kill you makes you stronger”—but that can be forgiven with all the fresh verbiage. 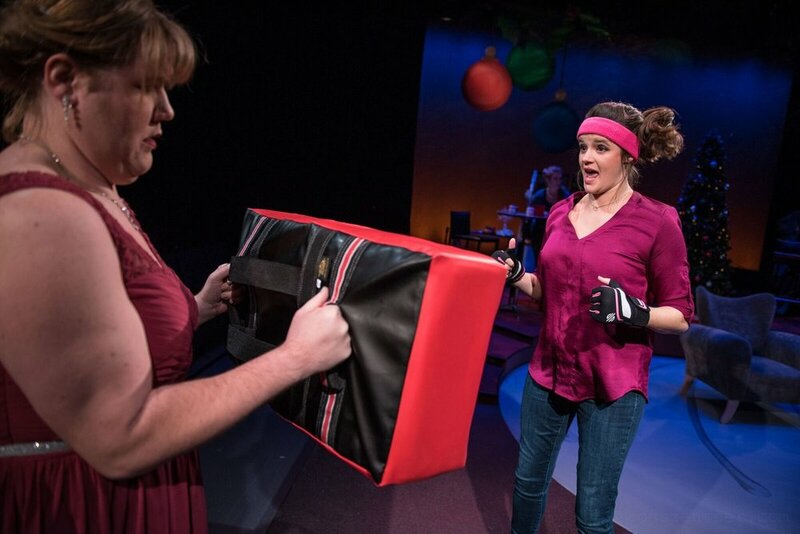 Mary (Susie Duecker) lets out her anger with some kick boxing. 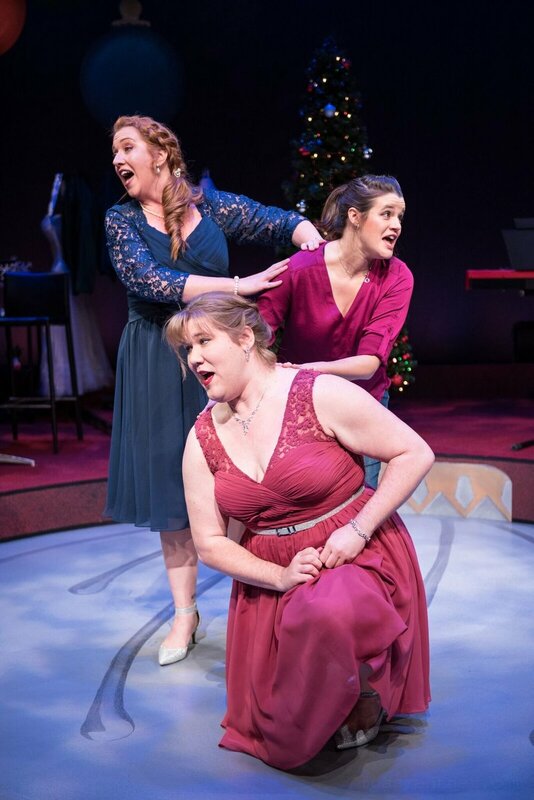 But while Duecker’s Mary is great fun to watch, it is the supporting trio that really elevates the show – the savory part of this delightful dish. With his smorgasbord of sounds and tunes, Wilson, who is also the show’s music director, adds humor and interest, taking a good bit to better and best, like the rock music accompanying Mary’s musician beau or the sweet strains of “As Time Goes By” when Mary meets her ex. And the Doo-Wop Duo drizzle the show lightly with harmonic tones, while organically providing props or costume pieces, or offering a comment with a gesture or expression, like a Greek chorus. Wilson’s music and the Doo-Wop Duo seamlessly flow through the show like one long strand of Christmas garland. 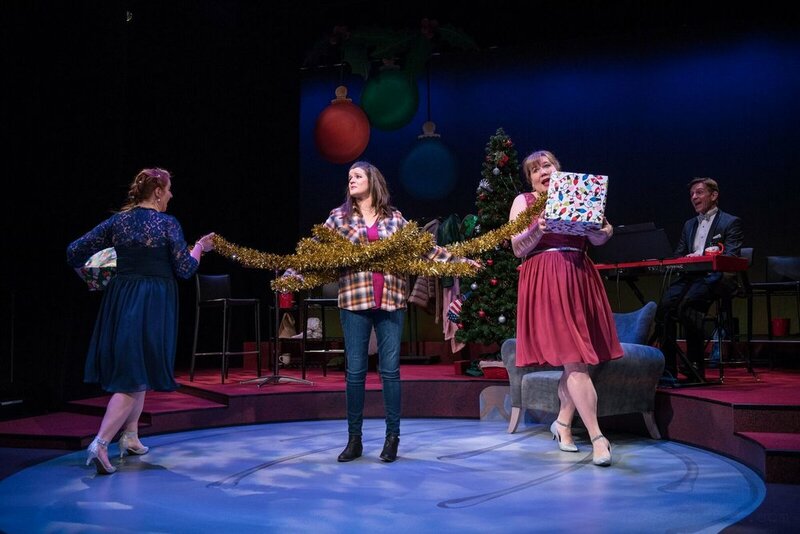 One of the few props, a Christmas tree, serves as a receptacle for all of Mary’s failed relationships, from a toy electric guitar to a mistletoe hairpiece. A clever device. Scenic Designer Rick Rasmussen and Lighting Designer Mike Van Dreser have created a simple, rich, handsome set with a backdrop of three large round ornaments on a wall that changes hues throughout the seasons – from burgundy, to blue, to purple, to chocolate brown in fall.